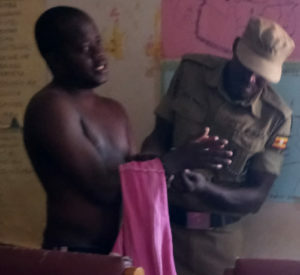 A policeman handcuffs Kyogonza after the latter battered the Masindi chief magistrate. File photo. The judiciary has condemned the recent assault of the Masindi chief magistrate, Catherine Agwero, by a convict who was protesting a six-year jail sentence. The convict Fred Kyogonza jumped out of the dock upon pronouncement of the sentence and started throwing jabs at the magistrate. The judiciary says the act by Kyogonza are uncivilised, offensive and disrespectful. “Judicial officers are merely arbiters who carefully hear both parties in a matter before making a verdict in accordance with the law. The law gives a dissatisfied parties a right to appeal any judicial decision up to the supreme court,” reads a statement from Judiciary. On December 13, 2017, Kyogonza, a medical officer, punched Agwero’s face after she imprisoned him over failure to pay a Shs4.8m debt to a creditor, disfiguring her mouth in the process. It took the intervention of Prison warders to save the judge from being mauled by the irate convict. In 2013, James Magadu filed a civil case against Kyogonza and court ordered him to pay suit to the latter which he had since failed to settle. Kyogonza has been slapped with charges of assault causing actual body harm and contempt of court for disobeying lawful orders.